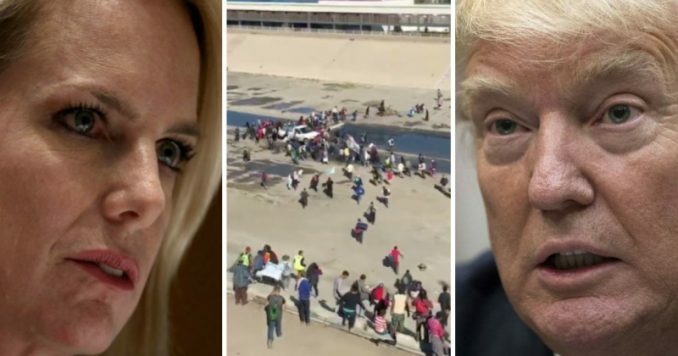 Department of Homeland Security Secretary Kirstjen Nielsen has had enough of the lies being circulated about the migrant caravan currently camped in Tijuana. She decided to air the ugly truth about these migrants, silencing President Donald Trump’s haters in the process. POTUS was right all along! “Given the activities of the last 24 hours at the San Ysidro Port of Entry, I want to provide an update on what occurred and attempt to dispel many of the rumors and much of the misinformation circulating,” stated Department of Homeland Security Secretary Kirstjen Nielsen. “Second, the caravan is far larger and more organized than previous ones. There are 8,500 caravan members in Tijuana and Mexicali. There are reports of additional caravans on their way,” added Nielsen. Of course, President Donald Trump has been noting the dangerous nature of many involved in the caravan for weeks now, only to be vilified by the mainstream media and the political left. Once again, the president has been vindicated. Once again, we learn that he was right all along — embedded within the caravan are hardened criminals, gang members, murderers, and rapists. If you honestly believe we ought to welcome these unvetted immigrants with open arms, the blood will be on your hands the next time an innocent American citizen is killed by one of them.